In a sort of comedy of errors, we’ve been trying to get out to Lodja (our post) for the past three weeks. Basically, we have one to two chances a week to get there on flights run by the European Community or the United Nations. Between a wet and muddy runway in Lodja, the Muslim holiday of Eid al-Fitr and airplane maintenance schedules (which, don’t get me wrong, we’re thankful for), we decided our best bet was to fly to the east of the country, to Goma, where Anne-Claire can learn a bit about the different types of programming out here. There’s also a direct flight to Lodja that seems to make the trip more frequently. Little did we know that the UN plane would be going to Nairobi for maintenance this coming week, stranding us here for another 7 days. Goma is not ever a place I thought I’d want to see, but now that we’re here, I’m happy we came. 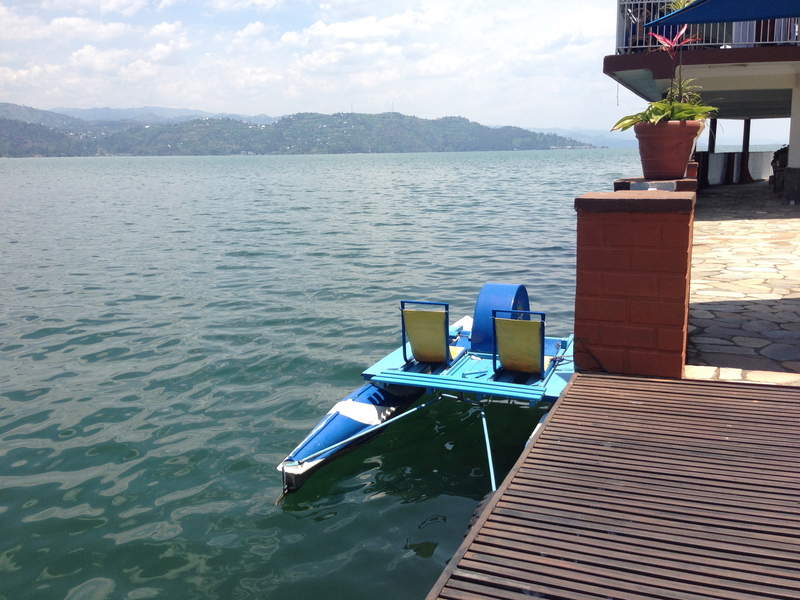 We’d heard that Lake Kivu, which stretches south of Goma to Bukavu, was a popular vacation spot before independence, and Peace Corps even used to have a language training center here through the early ’90s. In some ways, Goma and the surrounding area feel so out of place for Africa. As I write this, I’m sitting on the porch of our swank (and secure) hotel watching the sun rise over the hills of Rwanda just on the other side of the Lake. The sun is warm, but the fact that Kivu is also more or less an alpine lake moderates the temperature so it’s cool at night and never seems to rise above the mid 80s, even here in the heart of tropics. One of the pedal boats at our hotel. That’s Rwanda in the background. And yet the contradictions here couldn’t be more African. Our hotel boasts a small climbing wall, clay tennis courts, a pool and pedal boats, while just outside the walls sits a derelict town and a road to Rwanda – the border is a five-minute walk – that’s been a refugee thoroughfare through countless conflicts. In the stunning hills rising up right from the shore of the lake to more than 9,000 feet, some of the world’s last mountain gorillas share space with the ooze of rebel groups trying to secure their piece of this mineral-rich area. In our corner of the lake, I’ve counted at least a dozen bird species I’ve never heard of before, let alone seen, from sea eagles to kingfishers to loudly plumed cranes. The view into Rwanda across the lake is of green terraced plots, dense vegetation and spines of increasingly higher ridges fading into the distance. 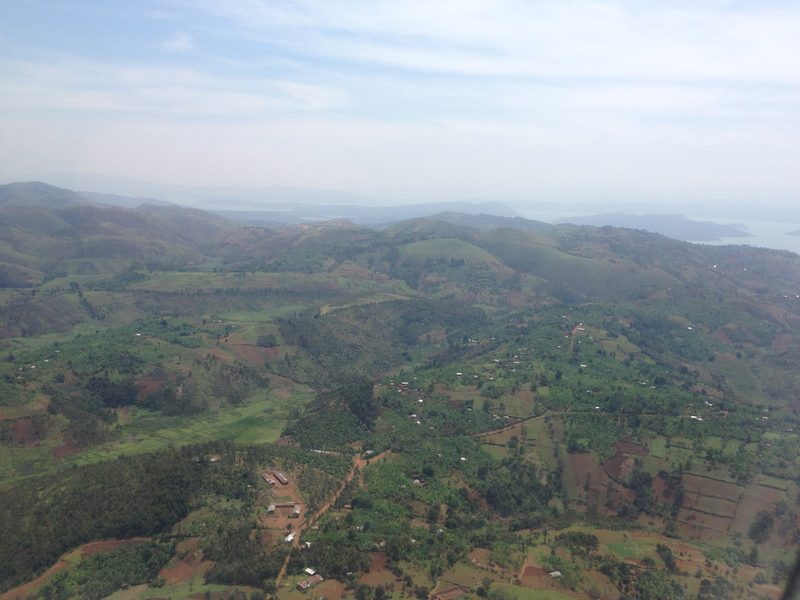 As we descended into Bukavu from Kinshasa on Wednesday, the blanket of green sharpened into fields of banana plantations, the namesake trees as thick as grass on a golf course. And yet, this is also one of the country’s, if not the world’s, most food-insecure places, as African big men, world power brokers and Western businesspeople play a constant bloody chess match, willing to wager people’s lives to get their hands on the copper, cobalt, gold, coltan, oil and whatever other valuable rocks just seem to be lying everywhere you look here. The local populations of course pay the biggest price. In one 20-month period at the end of the 1990s, an estimated 1.7 million people died in eastern Congo as part of conflict. Only 200,000 of those deaths, though, were the result of fighting. It’s here where the DRC, Uganda and Rwanda all meet. Not far off are borders with Burundi, South Sudan and Central African Republic. Throw in the interests of Tanzania, Angola, Zimbabwe, Libya and Namibia – all of which have played puppeteer with military forces in this resource-cursed country at one point or another, and you understand why Gerard Prunier titled his book Africa’s World War. I mentioned this book a couple of weeks ago, and it’s since become an obsession of mine. I thought that by reading his book I’d be able to understand (in a way my American brain always expects to) where the malevolent interests lie and who, for lack of a better way to put it, are the good guys. 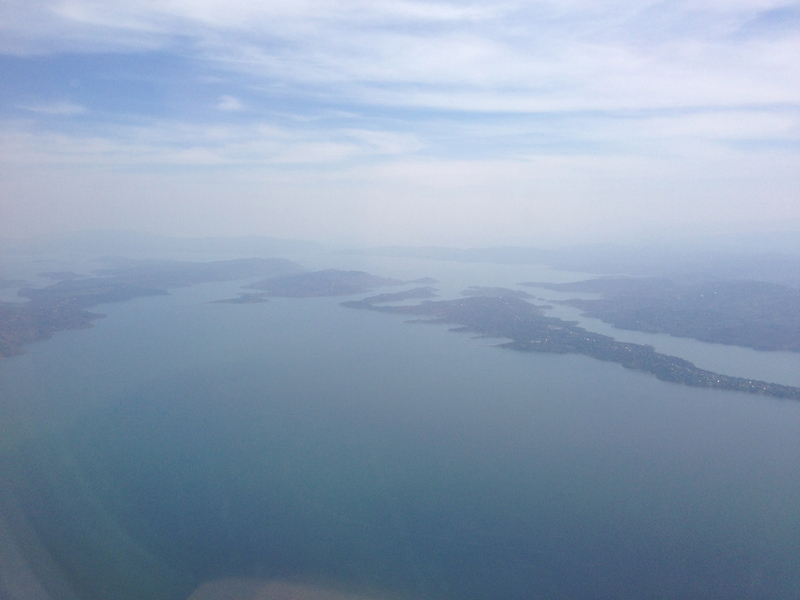 A view of the islands of southern Lake Kivu, just after taking off from Bukavu. The only conclusion I have come to is that the only “good guys” are the non-players, the people who stay out of the fray and try to farm the fertile hillsides here and who risk becoming collateral damage (as were the 1.5 million who died between 1998-2000) simply because of where they were born. The motivations behind the rest of the players seem to be a mix of justifiable anger at the West for centuries of oppression, racism and condescension, combined with unjustifiable Machiavellian greed spurred. The mix of characters and egos and self-interest makes George R.R. Martin’s Game of Thrones look like a feeble checker game. Like so many things about this continent, it’s nearly impossible to fully grasp. But as the cliche goes, this is an African story. To turn things around, if Africans are capable of the conniving and manipulation to spin the international community in circles to achieve their own desired ends, then aren’t they also capable of improving their own lot? Thankfully, this is also something I’ve seen firsthand, and therein lies Africa’s great hope. Here’s a quick slideshow of some photos (and video) I took at Lola Ya Bonobo, which loosely translates to “paradise for bonobos” (I’m told). It’s a beautiful refuge mostly for young bonobos, often those who have been orphaned because their parents have been killed for bushmeat. I’ll write a little travel log soon about our day there, but for the time being, I hope this provides a little window into the sanctuary. On the banks of the Congo River just downstream from Kinshasa and Brazzaville. I didn't post last week, but I have a good excuse. A group of terrific science writers who produce the prolific and fascinating blog, The Last Word On Nothing, allowed me to write a guest post for them about my struggles with language. It's online today. If you have a few moments, I urge you to leaf through the other posts. For me, it's an excellent window into the thinking minds of top writers. So often, the clichéd “cutting room” floor of a writer's office is littered with superb insights, funny anecdotes and good old-fashioned opinions that just didn't make it into the latest news story or feature. At LWON (as it's known), these writers have given themselves an outlet to share their curiosity and motivations. Right now, Anne-Claire and I are still in Kinshasa. Last Friday, we had packed up our apartment, pared down what we would need for the foreseeable future to the 20-kg allowance for humanitarian flights, and locked up the rest of our luggage for storage, in preparation for an 8 a.m. flight to Lodja. Five minutes before our schedule departure, they cancelled the flight because Lodja's runway was too wet for us to land. (Why they had to wait for us to go through all of the formalities to check whether, surprise, surprise, the dirt landing strip in the middle of the Congolese rainforest during rainy season is beyond me, but that fact seemed to have flummoxed the folks working for the flight's operating company) So we are here at least through this Friday, when we'll rise at 4 o'clock in the morning to go through the same process again, hopefully with a different result. What did Einstein say about insanity? Anne-Claire and I are excited to get out to our post, but Kinshasa has been surprisingly nice. We've met some terrific people and seen a bit of the city. We walk or run on 1.7-mile loop through an embassy neighborhood and by the river just about every day. And we're certainly not wanting for food – there's a woman at the office who makes huge plates of greens, beans, plantains, fish or chicken, and fufu (sort of like tuwo in Niger – here it's a sticky paste-mash of corn, millet, riz and cassava) for lunch. And the restaurants are on par in quality, variety and price with Europe or the U.S. I hope to post within the next week with a more substantive update of where we're at. For the time being, I'm working on a little slide show of some pictures and video I shot when we went to visit the bonobo refuge a few weeks ago. If the Internet cooperates, I'll post it tomorrow.